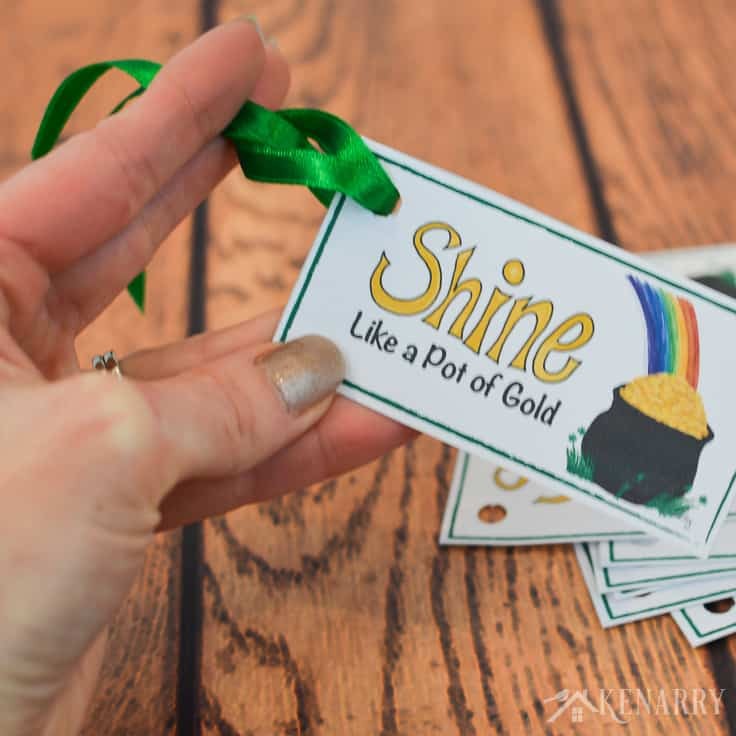 With these free printable treat tags for your St. Patrick’s Day party favors, your guests will shine like a pot of gold! This fun party idea features a rainbow and shamrocks. 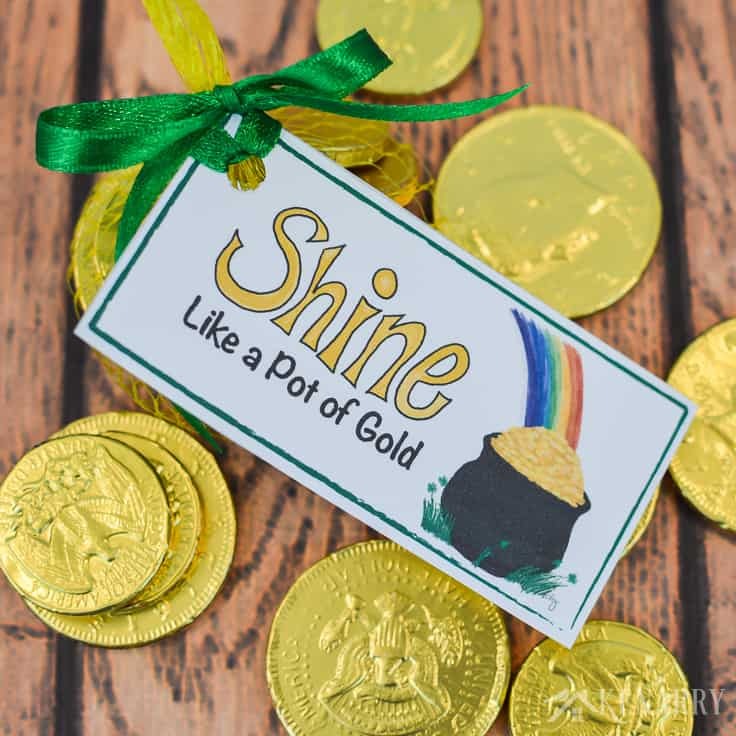 It works great with gold chocolate coins or other St. Patrick’s Day goodies for kids or adults. Hey there! Are you hosting a big St. Patrick’s Day party this year with friends and neighbors? 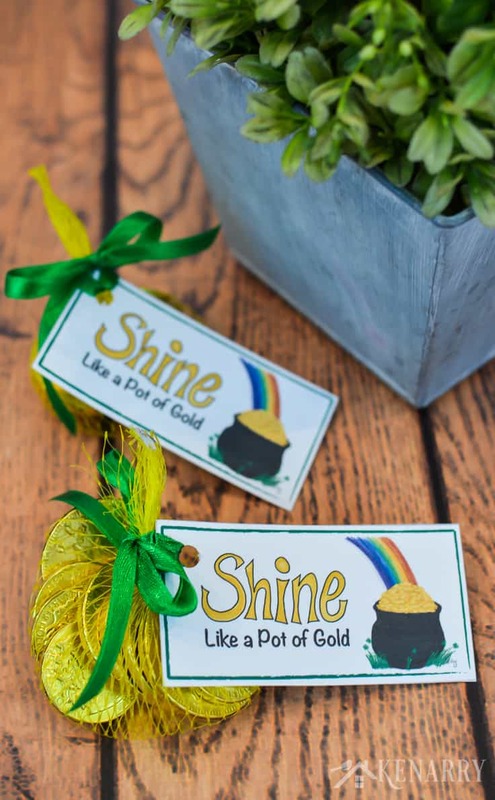 Today, we’re sharing exclusive free printable tags that would be perfect for your St. Patrick’s Day party favors. When I think of St. Patrick’s Day, I immediately think of shamrocks, rainbows and all things GREEN. But I also think of the folk tales about elusive little leprechauns and the mythical pot of gold you can supposedly find at the end of any rainbow. I mean really, who wouldn’t want to find a HUGE pot full of gold coins hidden in the woods somewhere. We’d be rich, I tell you! 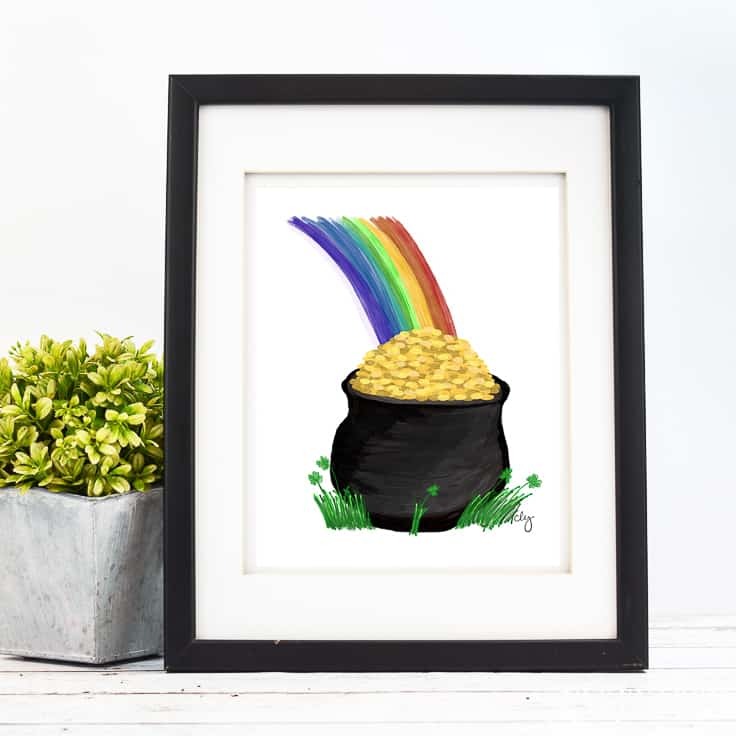 Our new St. Patrick’s Day Pot of Gold design is for sale now on Etsy. It’s an instant download 8″ x 10″ digital file that you can print on demand. Then you can frame it to decorate your home for St. Patrick’s Day or use it as clip art for your own craft projects. You buy the file once, and you can print it as many times as you want for your own personal use. 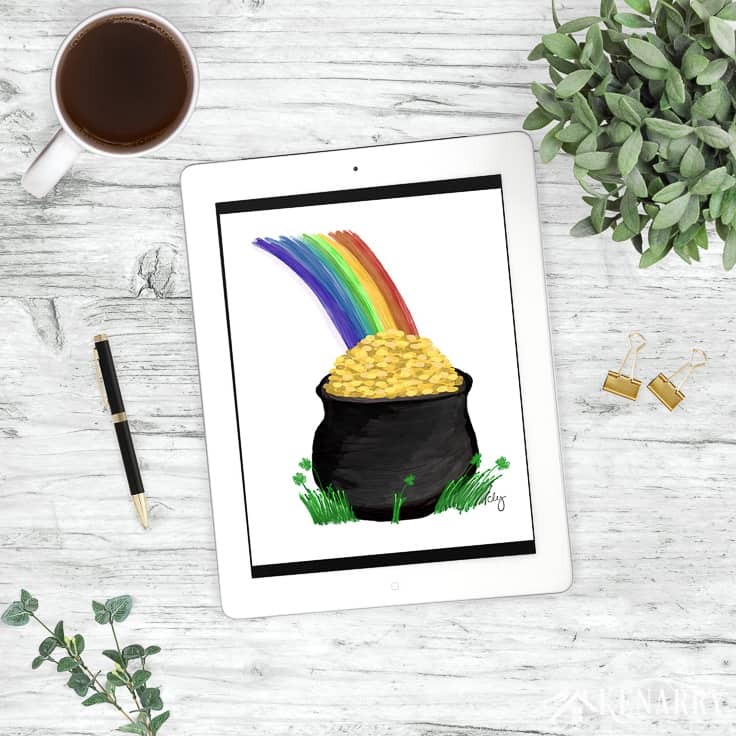 Your purchase comes with both a JPG and PDF version of the Pot of Gold art. Over the years, we’ve shared many, many St. Patrick’s Day treat ideas here on Kenarry. 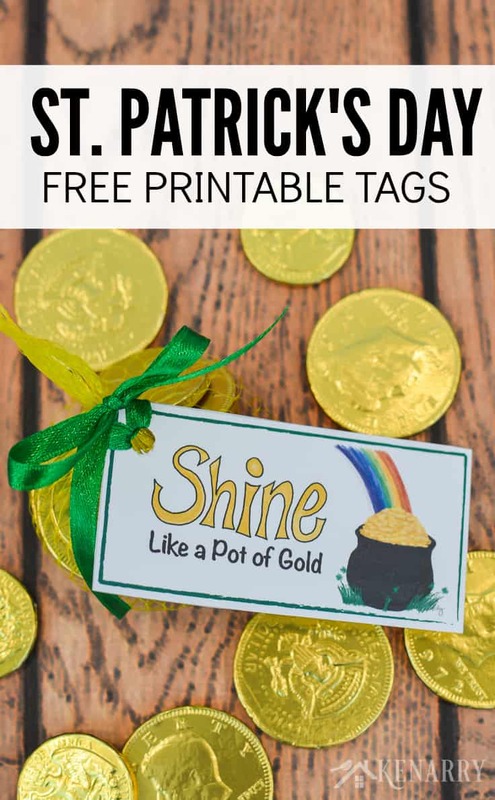 So I thought it would be fun to use the Pot of Gold design to also create a cute free printable tag for St. Patrick’s Day party favors. This treat idea works great if you’re hosting a St. Patrick’s Day party at home or school. The tags would also be cute to attach to treats for a March birthday or you could even use them as Valentine’s Day cards. 1. 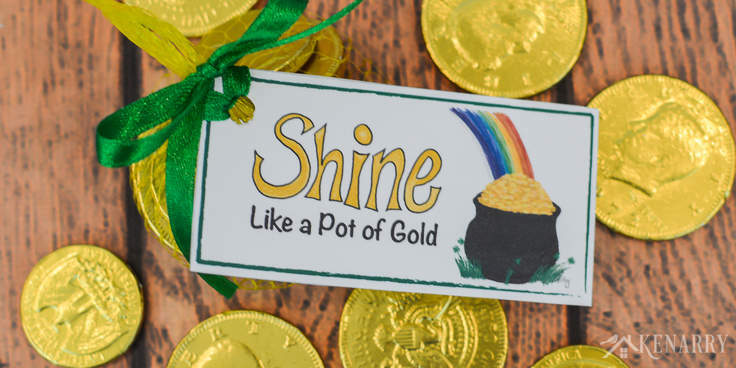 Get the tags for the St. Patrick’s Day Party Favors. 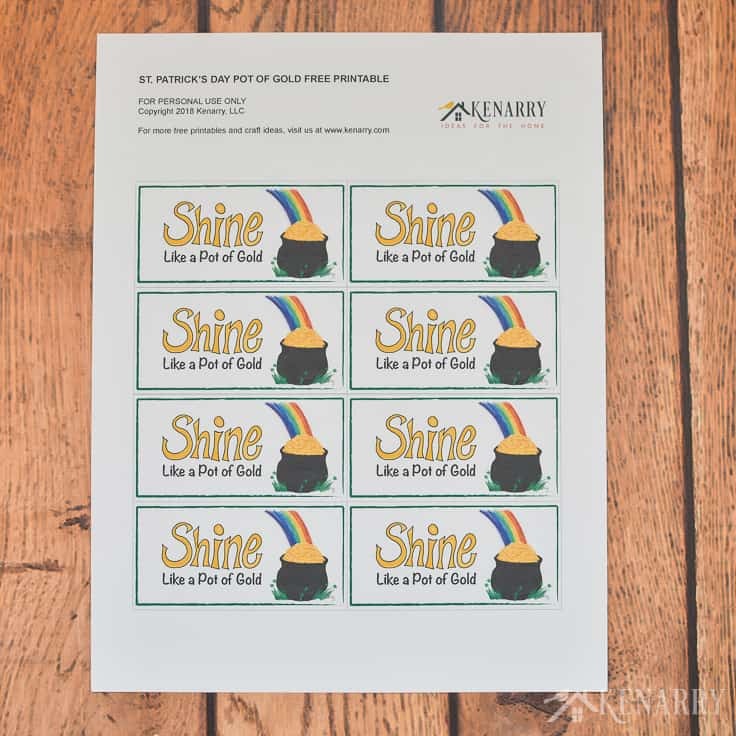 The printable St. Patrick’s Day party favor tags are available as a FREE gift when you sign up below! Then you just need to download the PDF file and save it to your computer. 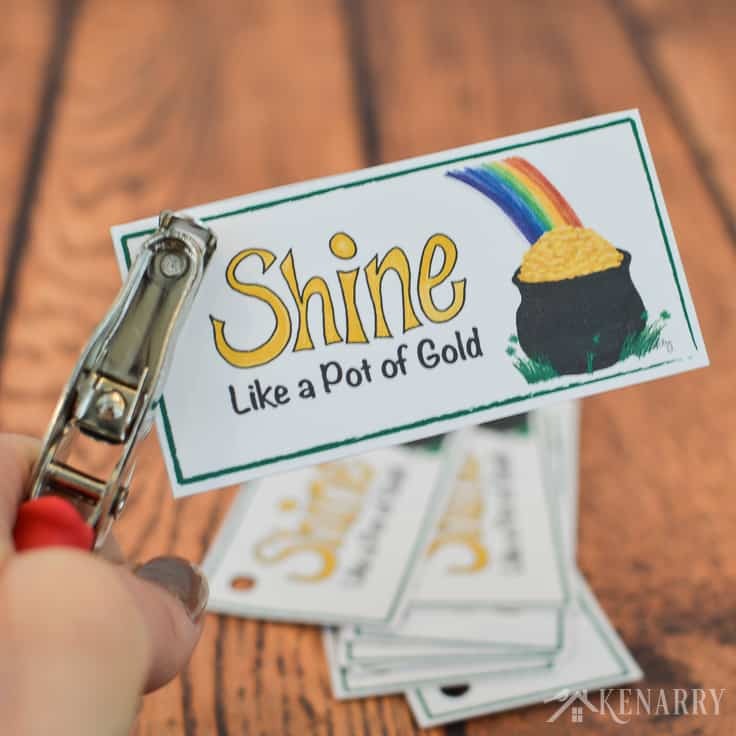 The St. Patrick’s Day party favor tags and all other free printables from Ideas for the Home by Kenarry™ are for your own PERSONAL USE ONLY. 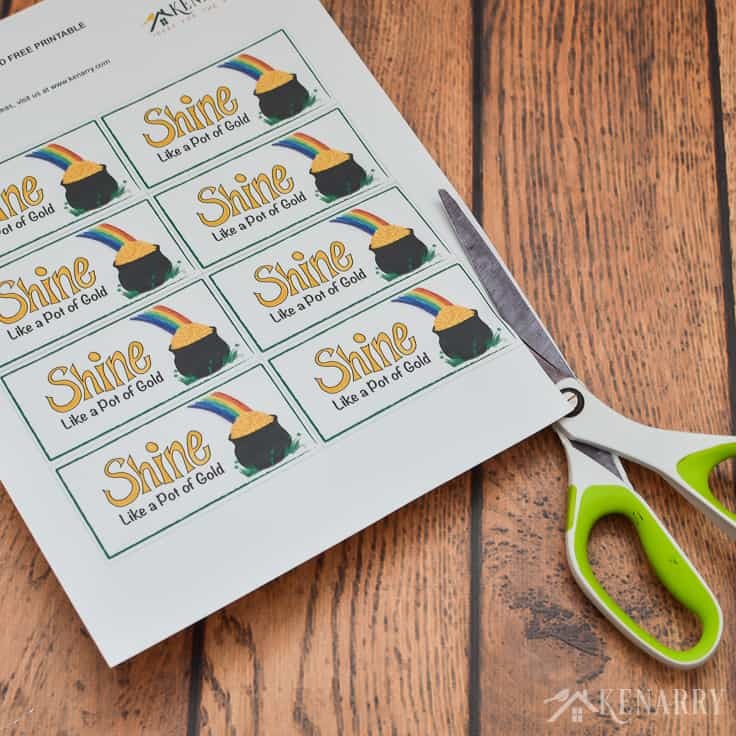 Once you have the file, print the tags for the St. Patrick’s Day party favors on white card stock. 2. Cut and punch the tags for the St. Patrick’s Day Party Favors. Use scissors to cut the tags apart or you could also use a paper trimmer. Next, use a single hole punch to put a hole in the corner so you can tie the tags onto the St. Patrick’s Day Party Favors. 3. Tie the tags on the St. Patrick’s Day Party Favors. Next, cut your ribbon about 10-12 inches long. Fold it in half and push the folded loop through the hole in the St. Patrick’s Day tags about an inch. Then pull the tail end of the ribbon through the loop. This will keep your tags facing forward once you tie them to your party favors. Then finally tie the ribbon around the top of your bag of chocolate coins to make a bow. 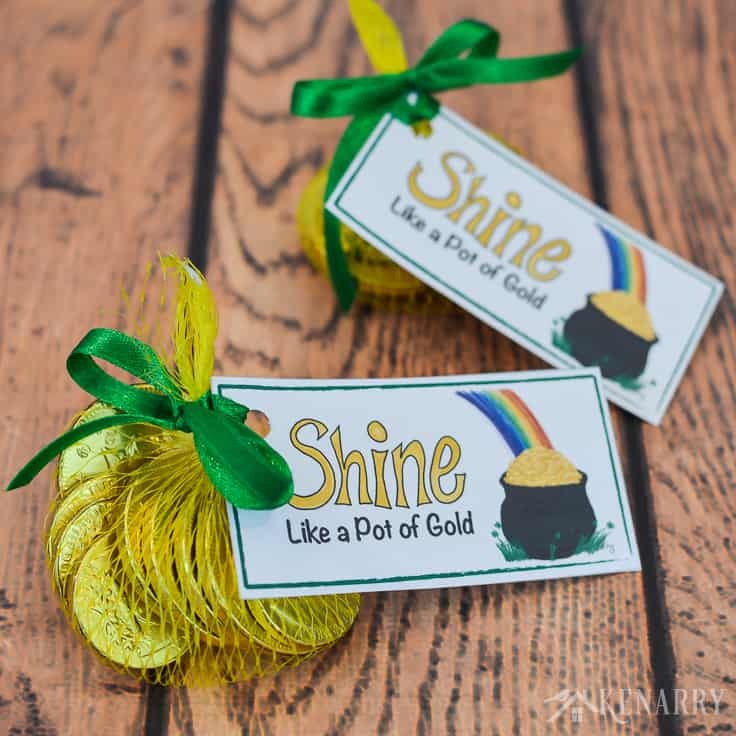 If you’re making these St. Patrick’s Day party favors for children, you’ll want to tie the ribbon fairly loose so they can easily remove it to get to their treats. 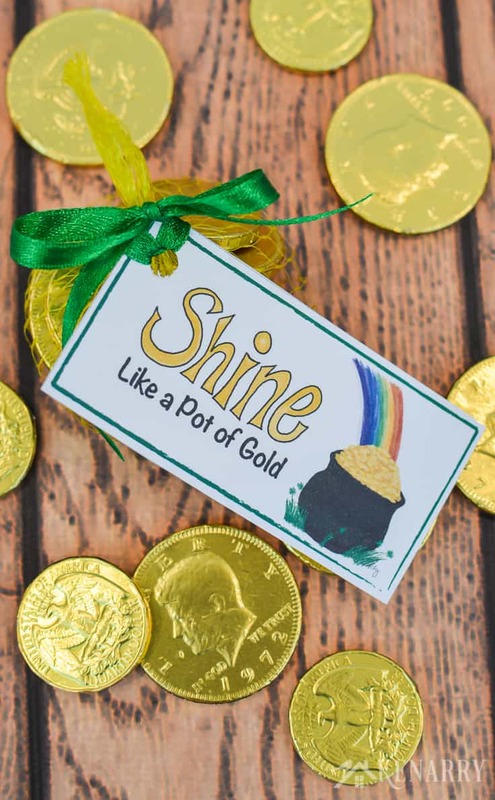 Repeat for all your remaining bags of chocolate coins until you have enough for everyone at your St. Patrick’s Day party. Fill clear cellophane bags with a homemade St. Patrick’s Day treat like Rainbow Meringues, Leprechaun Chow or Pretzel Shamrocks. 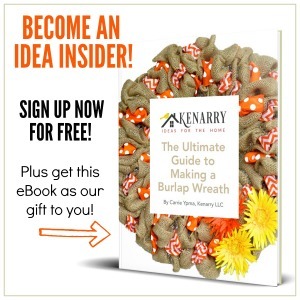 Then use these tags to make a gift for your friends and neighbors. Tie the tags around a bouquet of fresh yellow or gold colored flowers to wish someone luck before a big day or a big event in their life. Attach them to gift bags to give the cast and crew on the opening night of a school or community theater production – or any other special performance. Use them with birthday party favors for someone who loves rainbows, unicorns and all thing magical! These gift tags have become so popular that we’ve added a Lucky Shamrock St. Patrick’s Day Gift Tag as well. Make sure to check it out while you’re here. What other ways would you use these free printable tags? Please comment below and share. We’re always looking for new ideas!